1. Create a list template based on the list. 1. On the top link bar, click Documents and Lists. 2. On the Documents and Lists page, click the list that you want to copy. 3. On the page that displays the list, click Modify settings and columns. 4. On the Customize List_Name page, under General Settings, click Save list as template. 5. In the File Name box, type the file name to use for the template file. 6. In the Template Title box, type the title that you want to use for the template in the list template gallery. 7. In the Template Description box, type a description for the template. 8. Select the Include content check box. 10. On the Operation Completed Successfully page, click OK. The question is where to find the Save list as template in SharePoint 2013? See the picture below then you will know where to get it. 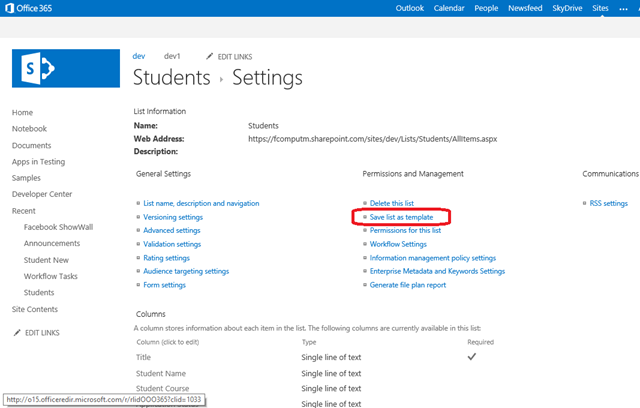 This entry was posted in .Net and tagged How to clone a List in SharePoint 2013, How to copy a List in SharePoint 2013. Bookmark the permalink. Yes, the link seems broken. You have problem to use the steps I provided? Read error on file “_catalogs/lt/Master_Checklist.stp”. Make sure there is no customize webpart or 3rd party component in your list. Thanks. I’ve been researching and think it may be due to User limit? I see guidance on changing but appears I need to escalate to company SP administrator? Central Administration > Application Management >Manage Web Application > Your Web Application >General Settings > Resource Throttling. Awesome. You just saved me 6 hours!!! !